Zoop joined forces with the Marvel Comics Group, one of the world's most prominent character-based entertainment companies. Together, ZOOP launched the Iron Man 3 collection inspired by the popular character in the Marvel Studio feature - Iron Man 3. Speaking about the association, Mr. Ajoy Chawla, Vice President - Titan & Retail, Titan Industries Limited, said, "To connect with kids it's important to be a part of their world. 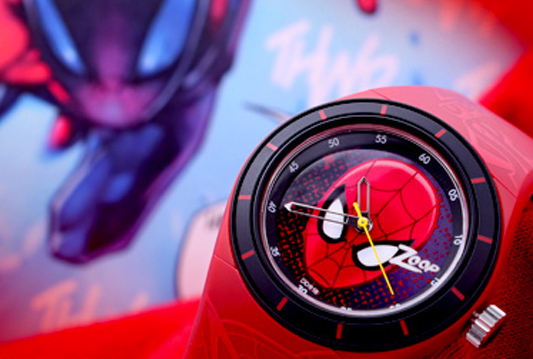 ZOOP's proposition 'Be Cool', its many exciting collections and this latest association with Marvel is an attempt to be true to this philosophy. This unique association with global brands like Marvel will present to our little consumers a range of exciting products that are inspired by their favourite Superheroes." He further added, "We are looking forward to launching the first of these products across India in May 2013." The collection priced at Rs.895/- comprises of 8 special edition watches for young boys and girls, in bold colours of RED, BLUE & YELLOW.